I don't have a clue who coined the phrase "life's full of important decisions", but it certainly rings true for the outdoor crowd in October. 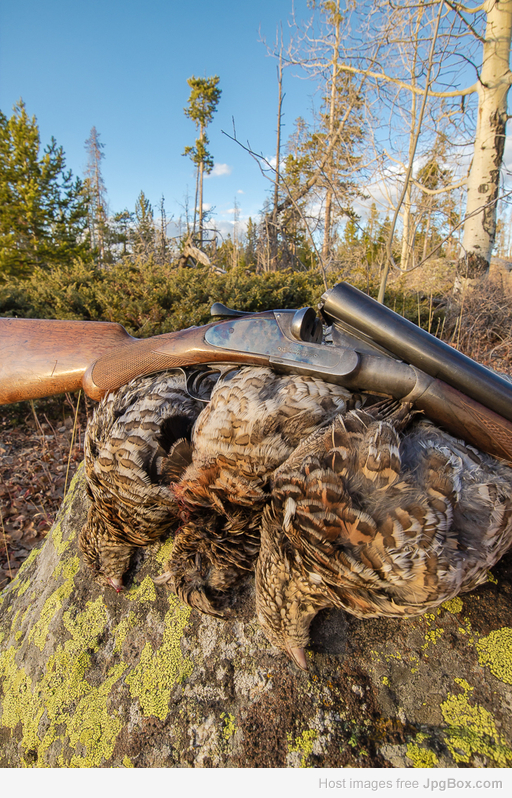 Fall fishing and bird hunting both beckon with a loud and resounding voice. Really, any choice there is a win, but still, the mind can circle endlessly trying to decide. Then there is the matter of gas money and travel. 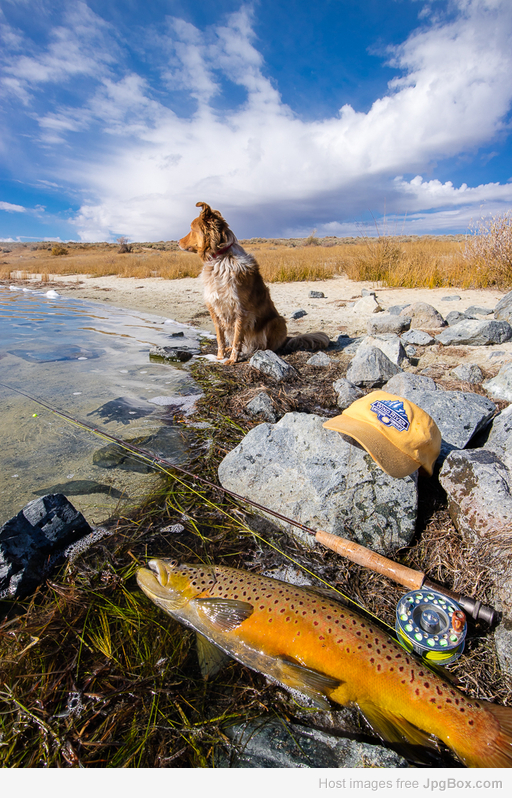 Last week I took a day and traveled some distance to fly fish for brown and brook trout, fish with broad shoulders, so to speak. Above this picturesque lake, the slopes are covered in a mix of aspen and evergreen, good ruffed grouse habitat. Well, behind the truck seat a Lefever 16 ga. was ready to go. So was my faithful companion, Rusty. 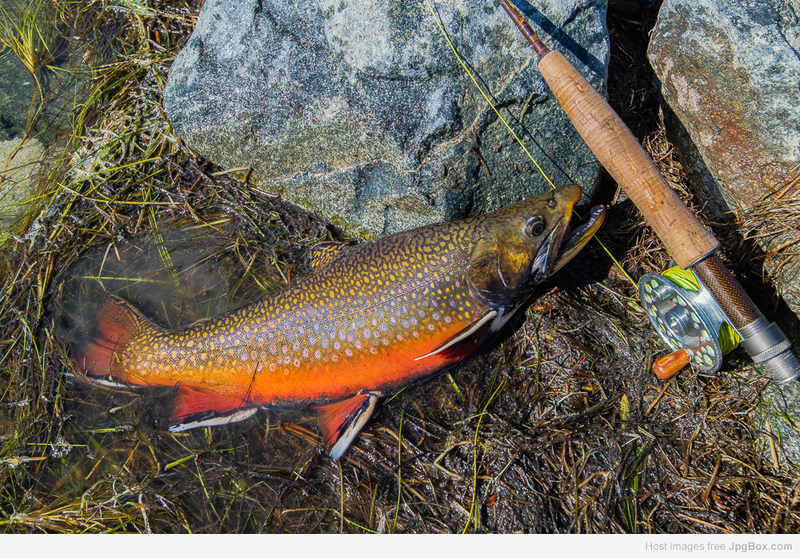 Yet the pull of fish on the 2 weight rod tugged harder than my desire to explore unknown grouse coverts. My conscience nagged me for a week. Today I set out to remedy the guilt. After a mid morning start, I rolled up to the lake somewhat prior to what the world considers lunch hour, barely. Once again the bite was slow and challenging, but oh my what beauties lurked about, often within easy view. Real "toads" they were, always good kindling for persistence and desire. The day was a classic case of just enough reward to keep me hanging on. Finally, the now leafless aspen patches above the lake tempted my urges, just as my flies tempted those big trout. This was new territory and the sun was getting lazy toward the western horizon. In two hours it would live up to it's agreement to swap places with a swelling moon, marking the start of a mild autumn night and the end of our chance to hunt. Where to start? 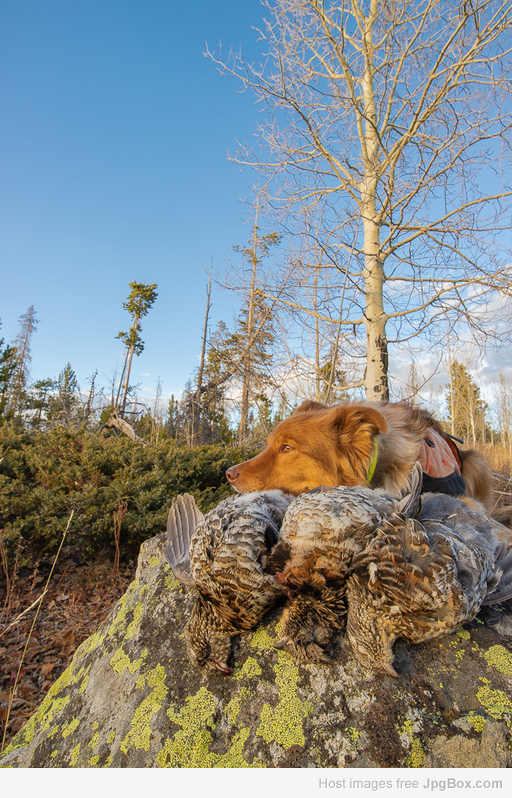 I did what made the most sense in dry country, or any country that ruffed grouse inhabit, I drove along searching for any watercourse I could find. After a few miles of torturing the 2wd gas saver over jeep trails I came upon a place where much doubt brewed concerning my ability to avoid immobilizing the vehicle where traction wasn't sufficient. A happy coincidence, the draw before us was boggy and looked right. Right it was. A few remaining ribbons of snow soon revealed grouse tracks of a semi recent nature. Oh sweet hope! 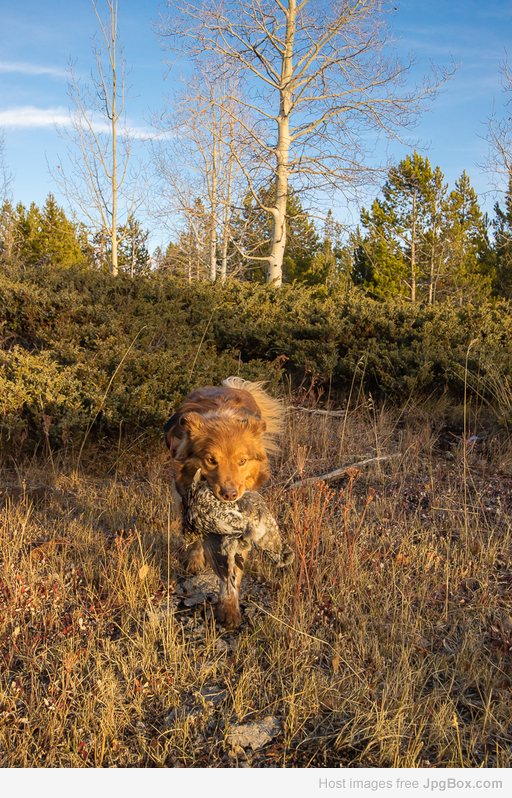 Before long Rusty pulled grouse scent from the fragrant damp leaves carpeting the forest floor and our first grouse was airborne shortly thereafter. A quick shot of #7 soft lead intercepted the flight before protective cover could rob us of a bird. Elated, I casually replaced the spent round with no haste; I was savoring the moment. 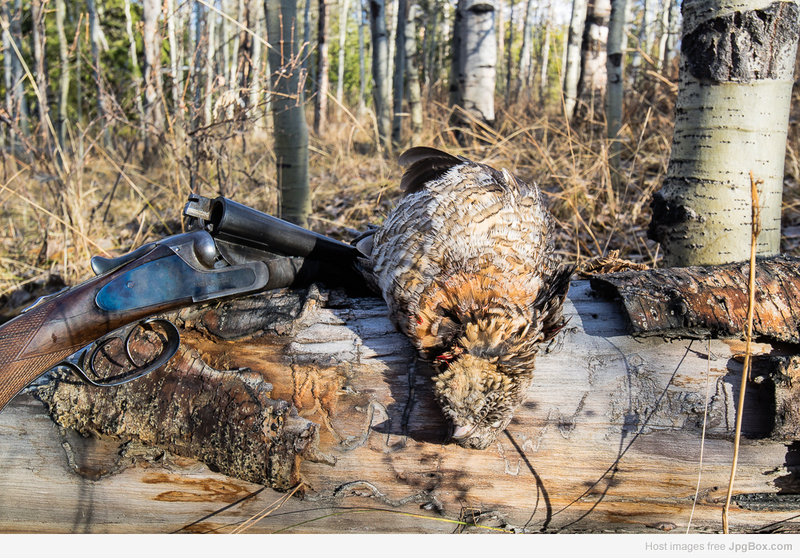 About the time I was fumbling the empty WW CF hull into the right cargo pocket of my pants, a second grouse erupted. 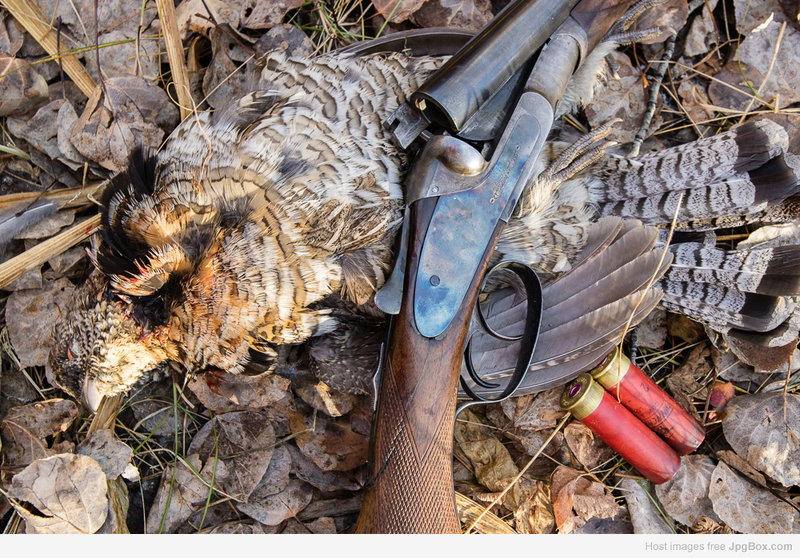 Well at this point my fat hand was wedged tight in the depths of said pocket while a grouse bore right down a shooting lane four feet wide, twenty yards long, and straight enough to snap a chalk line all the way to the end. Frantically I retrieved my hand, somehow without ripping the closure from my new pants, turned, mounted the little double and fired...just in time to dust the bark from the last aspen in that perfect corridor! Ooh yeah, rookie stuff there. Oh well, one ruff in hand made the whole effort worthwhile, even if we found no more. After a few laps hoping for a rematch, we moved on over the rise toward the next stand of aspen. Rusty either took pity on me or simply wanted more chances at a mouthful of feathers. There were more birds to be found, and enough of them he would indeed find. Grouse number three of the evening's bag made the fatal mistake of being caught out in the open. Had I missed that flush, Rusty may have disowned me. Thankful, neither of us found out for sure. A deep satisfaction kept us company on the long moonlit drive home. All is well with October indecision. Nobody said I had to choose only one option. What a fine October day. Thanks for the great pictures and story. A 2 weight? ..........and I thought you folks in Wyoming had a steady wind blowing all the time? Great stuff as always Wyo!! Don't believe it can get much better than that!!!! Sweet Jesus, now that is what I'm talking about. Well done. Frankly, this is why I come here. What a great post. Perfect story, great pictures. Thanks for taking me with you so to speak.